NetJSON added. It is a leader now in "Speed in the Large Scale". There's also a NetSerializer2 based on NetSerializer, though it doesn't seem to be updated for a few years. However, it does have better support for more native serializable classes. Can you add BOIS to the list? I think, I'll give it a service check, now that it fails in your tests. I know the article states that you ran on small number counts, but have you tested any larger collections? 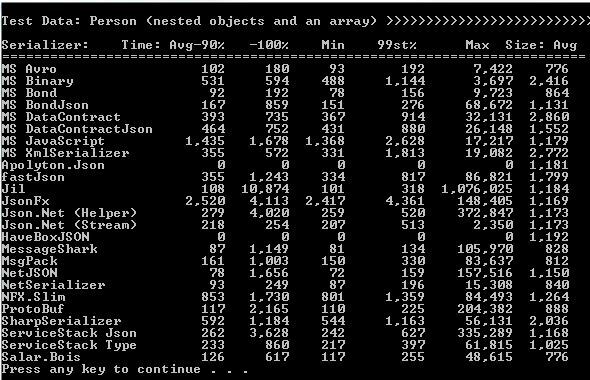 Compared the performance and functionality of hundreds of thousands of objects that need to be serialized? I recently ran into issues with the .NET binary serializer and the length of arrays. I ended up writing my own method as well as implementing ProtoBuf. I'm going to use your article and perform some additional testing but wondered if you had done so already.